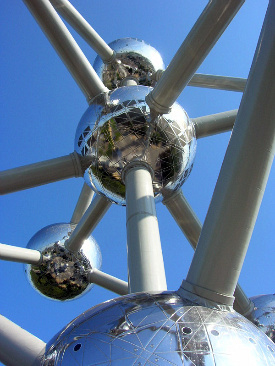 The iconic Atomium is as much a symbol of Brussels as the Eiffel Tower is one for Paris. This strange construction consists of 9 spheres representing an iron crystal magnified 165 billion times. 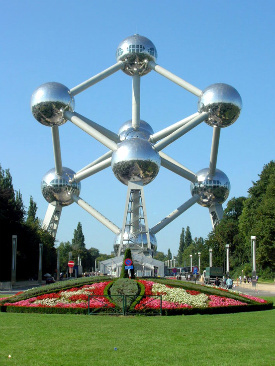 It was built for the World's Fair held in Brussels in 1958 (Expo'58) and designed by the architect André Waterkeyn. The structure was only scheduled to last for the 6 months of the Exposition. But the authorities quickly understood its touristic and artistic value and plans to dismantle it were dropped. The monument has a total height of 103 meters (335 feet). The spheres, which have a diameter of 18 meters, are connected by escalators. Three of the upper spheres have no vertical support, and so for safety reasons are not open to the public. In the top sphere one can enjoy a panoramic view of the city of Brussels through the windows, and in the other spheres there are several exhibitions. Much-needed renovation work was started in March 2004. The Atomium was closed to the public between October 2004 and January 2006, and re-opened in great pump in February, its spheres shining like never before. 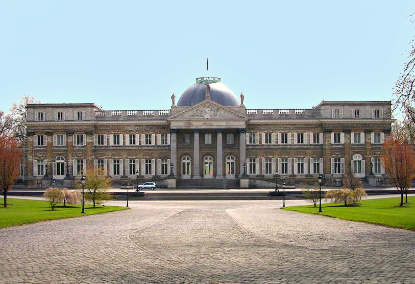 The adjacent Heysel Exhibition Park (Parc des Expositions), also known as Brussels Expo, is a cluster of buildings constructed in the 1930's to commemorate the century of independence of Belgium. There are several extensive halls used for various exhibitions, such as the annual Automobile Show. The largest of them is the art-deco Palais du Centennaire. At the foot of the Atomium, Bruparck is a leisure centre and one of Brussels top tourist destinations for people with children. Bruparck most popular attraction is Mini-Europe, a park with miniature reconstructions of some 300 of Europe's most famous sights, from London's Big Ben to San Marco's in Venice. "The Village" is the restaurants, bars and shops zone. It connects Mini-Europe to Oceade, a large tropical swimming pool kept at 30'C all year round and with huge water slides. The last zone of Bruparck is the Kinepolis Cinema, Belgium's largest cinema complex with no less than 29 theatres. Films are shown in original versions (OV) or dubbed in French (VF) or Dutch (NV). 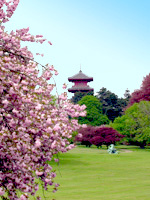 Visitors will be able to contemplate blossoming cherry trees in the gardens, with the Japanese pagoda (see below) in the backdrop. 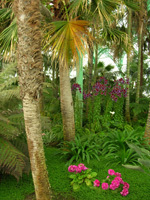 It is a real must for plant lovers if you happen to be in Brussels during this period of the year. One of the most unexpected sight in the Belgian capital would probably be the duo of the Japanese Pagoda (Tour japonaise) & the Chinese Pavilion (Pavillon chinois) in the Domaine Royale de Laeken. They are located about 1km south-east of the Heysel Stadium, one on each side of Avenue Van Praet. Erected in 1901 and 1903 by the architect Alexandre Marcel for Leopold II, they were originally just another fancy of the king, who had seen similar buildings at the 1890 World Fair in Paris. 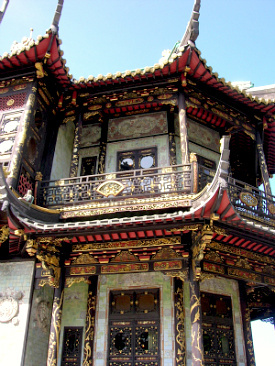 The construction was done by Belgian enterprises and French decorators, with the exception of the the Japanese sculpted pannels and copperwork commissioned in Yokohama, and the external woodwork of the Chinese pavilion produced in Shanghai. At the king's death in 1909, the Ministry of Foreign Affairs took over their management, which turned them into museums for Oriental arts, first opened to the public in 1911 (Japanese Pagoda) and 1913 (Chinese Pavilion). The Japanese Pagoda closed down in 1947, only to re-open after emperor Hirohito's death in 1989, but long closed again for renovation works. It now houses temporary exhibitions, and since 2005, the Museum for Japanese Arts, which possesses a collection of 17th and 18th-century porcelains as well as various works of arts from the mid 19th to the early 20th century. The Chinese Pavilion contains Chinese porcelains from the same period. 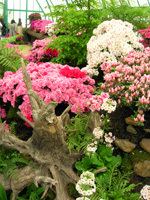 Together hthey form the Museums of the Far East, a branch of the Rotal Museums of Art and History. Both places are open from 9:30am to 5:00 pm and closed on Mondays. Admission in 3 €. Trams No 19, 23 and 52 and buses No 53, 230 and 231 will get you there. Note that tram No 52 is the only one passing through the city centre (via South Station, Bourse and North Station), and also has the most convenient stop. 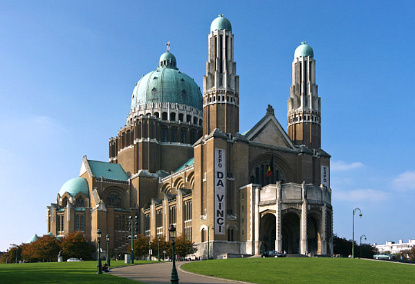 The National Basilica of the Sacred Heart of Jesus is located in the north-western district of Koekelberg, at the end of Boulevard Leopold II. The nearest Metro station is "Simonis". This eerie neo-Gothic and Art Deco edifice is the 11th largest church in the world, and the second largest in northern Europe after Liverpool Cathedral. 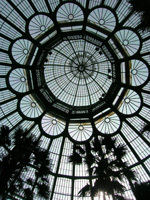 It is 140.9 metres long and is topped by a 90-metre high dome. It has been said to be the largest Art Deco style building on Earth. The construction started in 1905, but the First World War brought financial constraints and the plans were changed in the 1920's, explaining the discordant style. Although the church itself is not so appealing, the panorama at the top of the dome (admission 2.5 €) is well worth the climb.